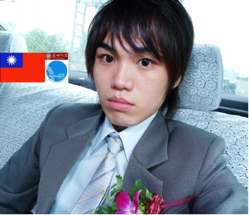 Jia-Liang Lai is currently a postgraduate student in department of photonics at Feng Chia University in Taiwan. He works in Professor Hui-Yu Chen’s group and his research interest is “observation the electro-field influence of the physical properties of the nematic host on blue phase”. He also likes capturing the beautiful thing by his camera in his daily life. In the usual time, he is not only a student, but also a great photographer. Thus, during his research work, he usually likes to explore the “art in science and science in art.” He takes lots beautiful liquid crystal pictures in the past one year through the crossed polarization microscope and his camera and enjoys his colorful blue phase research. From two dimensional pattern, the close-over lattice of blue phase looks like three dimensional structure, such like colorful nanorods. 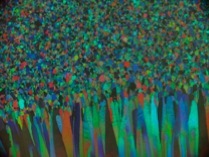 The picture shows the blue phase formed by mixing the 25wt% chiral dopant S811 into the nematic liquid crystals. The blue phase grows from the top of the picture and slowly extends the lattice area to the bottom. The cell gap was 8.75 μm, controlled by the ball spacer and no surface treatment was done here. The picture was taken on Olympus BX-51 polarizing optical microscope with 10X objective and Olympus digital camera E620. Jury comment: This is a beautiful picture of the blue phase texture showing platelets of blue phase with different facets reflecting the different colours depending on the orientation.